With much joy (and a little trepidation) we publish the first issue of our Parish Newsletter. For some time now, we have been thinking of issuing such a bulletin but did not have either the time or the resolve to do it. We have now launched it and, if God blesses, will try to continue publishing it regularly. In the Newsletter you will find Parish news as well as articles on the Orthodox Faith and Life written by the Clergy and members of the Parish as well as contributors from outside our Community. Our hope and prayer is that the Newsletter will help readers appreciate more the Treasure of our Orthodox Faith and encourage members of our Community to become more involved in its life. If, through this small endeavour, anyone is inspired to love Christ and His Church more, the editors and contributors of the Newsletter will be very glad and should give thanks to the Triune God, to Whom Only is due Glory, Honour and Worship. Holy and Great Lent is full of most beautiful hymns and prayers. However, there is one prayer which sums up the Lenten ethos more than any other. It is called the Prayer of St Ephraim the Syrian (4th c). This prayer is said in all weekday Services during Lent and in our private prayer rule. In the fourteenth century two men left their homes to become monks. Gregory Palamas, the son of a Byzantine noble family left the possibility of a career at the imperial court to join a monastic community on Mount Athos. Barlaam of Calabria, a Greek-Italian, left his home in Italy to find monastic life in the East. Barlaam sought out some monks to learn about prayer from them. They taught him that a fruit of deep inner prayer was a vision of God as uncreated light. Barlaam was shocked to hear this. The idea that God could be seen by people seemed to go against the principle that God is transcendent – totally other. A delicious olive pie ideal for the fast. St Mary of Egypt was an ascetic in the Judean desert. The Church venerates her especially during great lent because her example of repentance was magnificent. We are blessed to have the story of her life, told in her own words, as it was recorded by the monk Zosimas, who by the grace of God met her in the final year of her life. Ever since our daughter Judi reposed aged 17, 14 years ago, I have felt an unceasing desire to carry her in my life and in the things I do, to represent her in some way within my own faith and practices. I don’t mean the mere ‘memory’ of her as of someone who is dead, but the conscious reality of a young lady who now reposes, who rests in the arms of a God who says that he is not the God of the dead at all, but of the living only. This year marks the 30th anniversary of our Archbishop’s appointment as the spiritual leader of the Archdiocese of Thyateira and Great Britain. Since his enthronement, Archbishop Gregorios, who is 90 this year, has worked tirelessly for the spiritual edification of his flock and the organisation of the communities under his care. During his pastorate a great number of communities have been founded (there are today 118 communities under his care), many with their own Church building and School. He also ordained many priests and deacons, a considerable number of whom are native of the British Isles. The senior Orthodox Hierarch in this country, the Archbishop is well regarded in both Church and society as a voice of prayerful wisdom, pastoral discernment and loving directness. 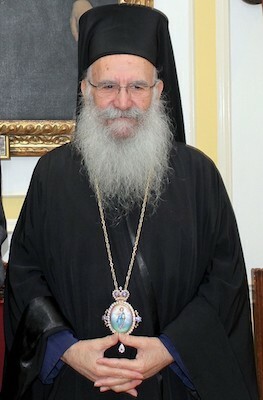 Archbishop Gregorios is an inspiration to us all. Lord, grant that our Archbishop may serve your Holy Church in peace, safety, honour, health and length of days, rightly proclaiming the Word of Your Truth! 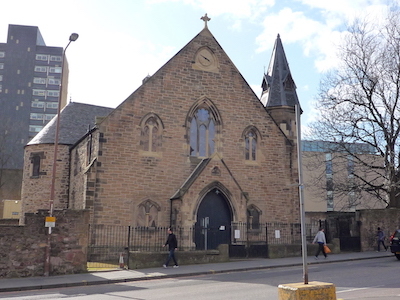 External works in our new Church in Chapel Street have been almost entirely completed. The roof has been repaired and re-slated, external walls have also been repaired and repointed, stained-glass windows have been masterly restored. Also, our Church building is now, for the first time in its 263 years of history, adorned by two very beautiful Crosses produced by a skilled local stonemason: one on the top of the roof and one over the east elevation. Thanks be to God and to our generous Benefactor. On the 15th March our Student Society had its AGM and elected a new Committee. We wish them good strength! 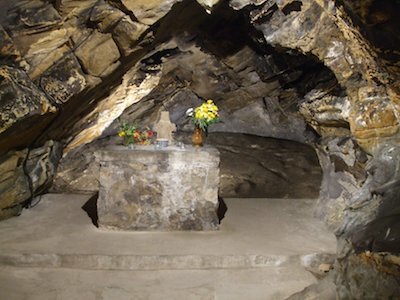 The following Saturday, the Society went on a Pilgrimage to St Fillan’s Cave in Pittenweem and St Andrews, Fife. In one of Scotland’s ancient Christian holy places, the Cave of St Fillan, we sang a Supplicatory Canon to the Saint who lived there in the 8th c. It was a joyous and moving occasion which connected us, a group of 21st c Orthodox Christians from various countries with an 8th c. Scottish Orthodox Saint and reminded us of this country’s Orthodox Christian roots! Site built by Jakub Hampl. Copyright 2019 St. Andrew's Orthodox Community.